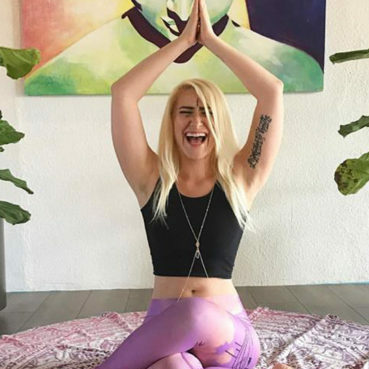 Hannah first discovered yoga at twelve years old through her mother’s best friend, Phyllis Tannebaum, a Kundalini teacher for nearly 20 years. It wasn’t until her later teen years she realized what an important aspect of life yoga can be- on and off the mat. Hannah is a RYT 200 certified instructor through Yoga Alliance. She completed her training at Red Pearl Yoga in 2013 studying under Surendran Pandarran, Lisa Pumper and Jessica Lohrey. Since teaching yoga, Hannah has also become a Reiki Level II practitioner certified under Nipa Dooshi. Hannah enjoys inspiring others to improve wellness of the mind, body and spirit. Her classes focus on deep stretching and breathing techniques while trying to open the mind and relax the entire body. She uses a slow and restorative gentle-flow practice that ends with crystal bowl sound healing and guided meditation. Hannah has appeared on The Today Show during a segment on yoga and is a fitness-model for Zumba® Wear. Hannah worked for TOMS Shoes in 2008 as the first group on interns to sell shoes across the county hosting events and universities all over Southern California. She also teaches yoga once a month at Tap 42 with all proceeds donated to a charity or nonprofit organization of her choice. When she’s not on the mat, you can find her practicing Reiki or at Hanson concert. In bed with my 2 French Bulldogs. My Mom’s best friend-a yoga teacher.